Recently released, but two weeks ago, is the new Phoenix Inverter VE.Direct firmware version v1.03, which besides a few internal changes, has a major new feature – the addition of Dynamic Cut-off. Some of you may know it from Hub-4. What it does is this: instead of using one fixed battery voltage as the low battery shutdown level, it also looks at the battery current. This makes sense, as we all know battery voltage drops when putting a load on it; caused by the internal resistance of a battery bank. Previously you had to pick one voltage and enter that as the low voltage shutdown level, which would never be right. For example setting it to 10.5 V will do fine while powering significant loads. However, when left like that for a couple of weeks, without high loads, the inverter will keep on drawing power from the battery until it hits 10.5V, by which time a lead acid battery will have suffered damage as it has now been discharged too deeply. And putting it at 12V, which would be a nice cut-off value for a battery without load, won’t work either because as soon as you do put a load on the inverter it will shut down almost immediately. Dynamic Cut-off fixes this issue by using not only the battery voltage, but also the discharge current to determine the battery empty condition. During configuration, choose the battery type and enter the capacity of the battery bank. The type is necessary to select the right charge curve as not all batteries have the same internal resistance. The capacity is necessary because the current drawn needs to be put in perspective in relations to the size of the battery or battery bank. Perhaps to understand this more easily imagine a huge battery bank; a football field full of batteries. Now picture one small 250 VA inverter in the corner. Even loaded to full power, this inverter will not make the voltage of that huge bank drop one iota, as the load is negligible compared to the size of the bank. Note, that although possible, it is not necessary to change the four Voltages. They will be automatically set to the optimum for the chosen battery type. Do not enable Dynamic Cut-off in an installation that also has other loads connected to the same battery: the battery voltage will drop because of the extra load, but the Dynamic Cut-off algorithm in the Inverter is not aware of that load: hence the Inverter will shut down too early; with an under voltage alarm. Use our VictronConnect software. Available for smartphones and tablets (iOS and Android) as well as Windows and Mac computers and laptops. Upon connection to the inverter, VicronConnect will automatically update the inverter to v1.03. Note that there is no need to first obtain the new inverter firmware file, as VictronConnect already carries that with it. To find the cut-off voltage to be used for a certain discharge current; first calculate the discharge ratio. It is defined as the battery current divided by the battery bank capacity. So for example, drawing 100A out of a 100Ah battery, results in a ratio of 1. Looking at the appropriate curve, this will result in a cut-off voltage of 12.3 V for a Lithium battery. 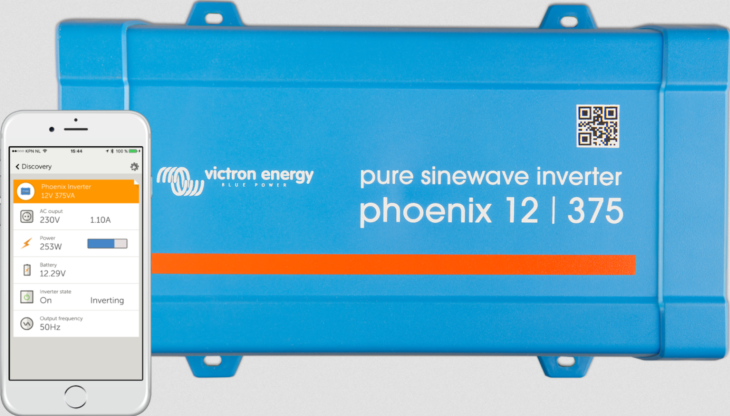 And when the OPzS chemistry is chosen in the settings, drawing the same current will result in a much lower cut-off voltage: 10.4 V.
For more details, see the Phoenix Inverter Dynamic Cut-off manual. CLAFIS Victron Energy solar boat team: World champions!